The 8 Best Hot Dog Joints in Missouri! Whether you like your hot dogs with the works, a few condiments, or just plain on the bun, you can satisfy your craving for a delicious dog at one of these famous Missouri hot dog joints. 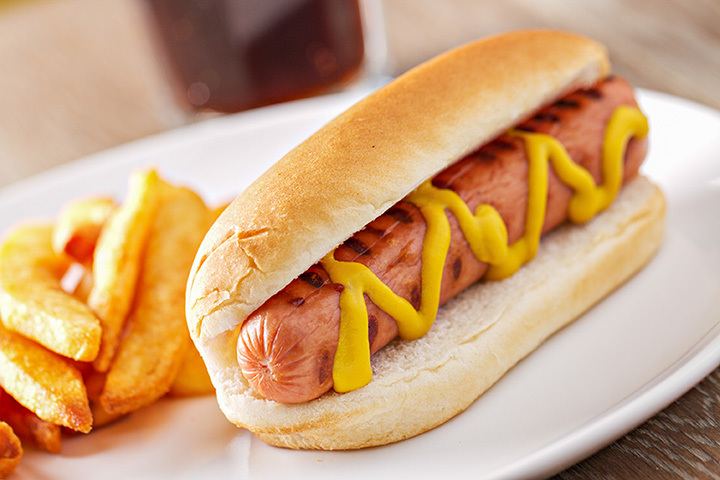 And don’t be surprised to find some special, Missouri-style dogs you won’t find anywhere else! Here are our 10 favorite places to get a hot dog in the state. Instant Karma is a hip little place in downtown Joplin, specializing in gourmet Black Angus hot dogs. Try the Chihuahua (a hot dog wrapped in bacon and topped with sour cream and avocado), the Tueben (sauerkraut and Swiss cheese), or any number of other customer favorites. Instant Karma even sells vegetarian hot dogs, for the socially-conscious hot dog lover. From a traditional hot dog cart on the streets of Rolla, to a small concession trailer, to a little storefront restaurant, O’Doggy’s is quite the success story. It sells delicious all-beef hot dogs with all the toppings, as well as a variety of brats and sausages. Dogs ‘n’ Fries is a cozy little place in Florissant, just outside of St. Louis. It offers a variety of gourmet hot dogs to choose from, including the peanut butter jelly bacon dog (which is exactly what it sounds like, with the addition of caramelized onions), and the sweet & spicy dog (spicy raspberry sauce, sweet barbeque, jalapenos, and cheddar cheese). Dog ‘n Frys offers huge portions and reasonable prices. Mickey’s is billed as the best Chicago-style hot dogs in southwest Missouri, with plenty of customers to back up the claim. People come from miles around to eat at Mickey’s, and if you’re in Branson for a show, it’s a must for a reasonably priced pre-show dinner. Housed in a 60s-style drive-in stand in suburban Overland, Woofie’s serves only premium Chicago-style beef hot dogs, smoked with a little hickory flavor. Portraits of the celebrities who have stopped in line the walls—and there are many of them. Try the Big Daddy (advertised as “a quarter-pound of beef in a special casing”) and the Rueben Dog, complete with Swiss cheese, pickle, Thousand Island dressing, and sauerkraut. A specialty hot dog joint on the Independence Square, UpDog prides itself on “fresh, delicious hot dogs, grilled to order.” Try the Chorizo Dog and the Chili Frito Pie Dog—a couple of customer favorites! Steve’s Hot Dogs is consistently ranked among the best restaurants in St. Louis, with locations around the city. Customer favorites include the Bacon Bacon Jamaican (smoked dog with two slices of crisp bacon, pepper jack, jerk seasoning, bell peppers and sweet chipotle sauce) and the famous chili cheese dog. You can tell Angelo’s Chicago Taste is going to be good, because they put all their resources into their food and very few into their setting! Angelo’s is no-nonsense—you walk up to the counter, place your order, and that’s all there is to it. They dish out sandwiches, Chicago-style hot dogs, and other easy-to-carry foods. You can sit at one of the few indoor tables, but most people take their dogs to go, for a great meal on their lunch breaks or as the main dish in a riverfront picnic.